The career of everyone involved with this film have faded into near obscurity (by choice or not). Crowe is not A-list anymore. His last two films, NOAH and ROBIN HOOD, weren't massive hits. He's to appear in a yet another remake of THE MUMMY, playing Dr Jekyll(!). That film stars Tom Cruise. Aside from THE MARTIAN, director Ridley Scott hasn't had a big hit since then. And Joaquin Phoenix is too busy dating 19 year old girls. 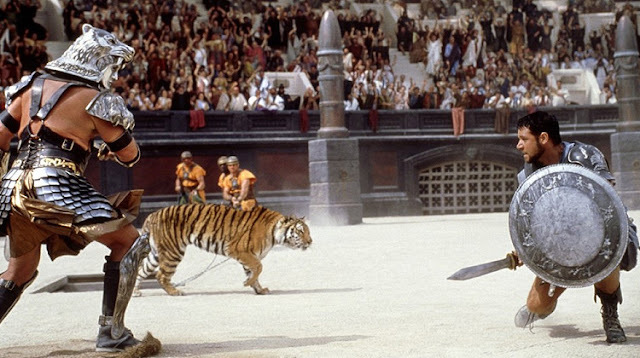 GLADIATOR won best film back in 2000. It must have been a really poor year. Since I'm a big fan of the PEPLUM genre and know everything about them, GLADIATOR wasn't really that special to me. It was a huge hit though and it did sorta re-ignite a new PEPLUM explosion but the output has been sporadic and the qualityvaried tremendously. Do you think Hollywood will remake this film (which was an indirect remake of countless films from the 1960s)?